Thanksgiving Day is not Thanksgiving without cranberries. In these cranberry sauce and cranberry chutney recipes, you will find new light on a holiday classic. All sauces have some spiciness to them, but their heat ranges. They are exotic, interesting, and most of all: pleasant to your tastebuds. 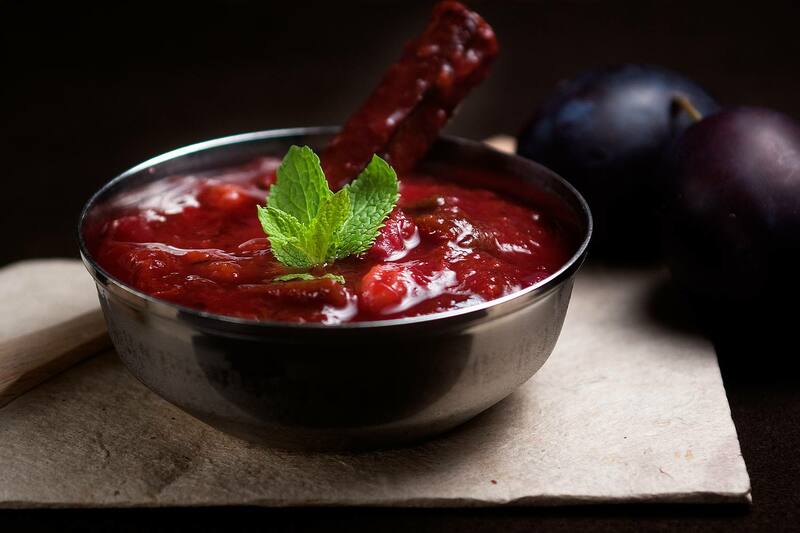 This holiday season switch the traditional cranberry sauce for this sweet and spicy plum chutney. Your guests won't be disappointed! This highly rated and easy to prepare cabernet cranberry sauce recipe is made spicy by adding just a pinch of cayenne chili. Recipe by John Mitzewich. Ramona of Curry and Comfort helps us save time with her spicy and quick cranberry pineapple chutney recipe. She says the following "This sweet, spicy and tangy cranberry sauce will go perfectly with our Thanksgiving day meal and also go well with any rice and curry dish." Now, what's not to love about that! The spiciness in this merlot cranberry sauce comes from the peppery allspice. This recipe is a mild one, so perfect for everyone. Layla, of Laylita's Recipes, not only gives her spicy cranberry, mango, and cilantro sauce a spicy touch, but also a tropical twist. The tart, sweet, and spicy flavors in her recipe are a must try! A gorgeous spicy cranberry pepper chutney that is awesomely described by recipe creator Jillian Bedell, "...this cranberry sauce is like life, simple yet complex, sweet and spicy, beautiful, a bit tart, and doesn’t come out of a can." The American cranberry sauce gets a Mexican makeover in this stellar Guajillo cranberry sauce recipe. Tangy, sweet, and a tad spicy, Vianney's recipe will be a huge hit.